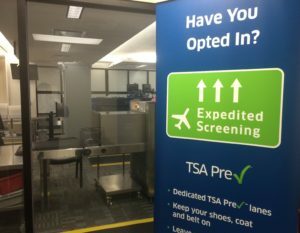 TSA Precheck centers are now available in many unexpected places, expanding the opportunity for more travelers to take advantage of this time saving feature. Precheck stations allow frequent travelers to get through security quicker. The process is quite simple. Upon application some basic information must be provided along with an $85 registration fee. Once clearance is received, it’s good for 5 years. The program is being endorsed by several large corporations, including American Express, JetBlue and Hilton Honors, and each of these companies are rewarding their members who complete the process with a reimbursement or some other type of incentive. 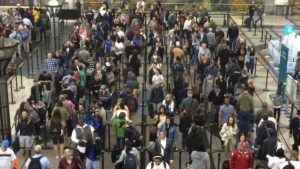 The TSA is now focusing on getting even more people into the program and their efforts seem to be working. There are currently nearly 250,000 new people enrolling each month and that number continues to grow. TSA PRECHECK LINES ARE SHORTER THAN STANDARD SCREENING LINES! The Precheck program was designed to reduce some of the hassle people experience when going through security checks at the airport. It’s been shown that most who are members of the program experience a significantly shorter wait time and 95% will wait 5 minutes or less. When you apply for the program, you’ll have an in person appointment that will involve a background check and being fingerprinted. Once you’re approved, which usually happens within 5 days, you’ll receive a “known travel number” or KTN. It’s very important to know this number as it is needed when booking reservations through an airline or travel agency. When booking through a third party travel site, it’s essential that your name matches exactly on all documentation and ensure that your KTN is correct to make sure you’re able to go through the Precheck lane without incident. Those in the U.S. Armed Forces are eligible to participate using their DoD ID number as the KTN. There are many new places where travelers can register for the Precheck program. Recently Precheck enrollment checkpoints have been set up in Department of Motor Vehicles throughout the state of Virginia and it’s likely that other states will follow with similar options. MorphoTrust, the entity that’s partnering with the TSA in the program, has worked to get checkpoints in many different places to make them accessible to more people. These registration points have been set up in H&R Block locations in 27 different states. They have a current summer program to put pop-up centers in various hotels throughout the country. They also plan to set up enrollment centers at concerts and festivals. The concert promotion company LiveNation is currently encouraging all concert goes to register for the program, giving access to many who would probably have not taken the time to register for the program otherwise. TSA Precheck will save you time when leaving on a trip at participating US airports only. If you travel outside the country often, I also recommend that enroll in Global Entry as this will save you time upon your return the US (also only at participating airports). Those who are looking for an enrollment center can visit the TSA’s website and input their zip code on the Precheck information page. The search will return with the locations of the nearest enrollment facilities. The program is available for both domestic and international travelers. There are over 180 airports and more than 16 airlines that participate in the program. Once approved, the Precheck status will appear on the boarding pass. Once the pass is scanned, the TSA agent will redirect travelers to the Precheck lane. It’s important to know that children 12 and under who are traveling with an eligible parent or guardian may also pass through the Precheck lane. Travelers 13 and older need to apply for their own Precheck enrollment to be able to use the service. The process of using Precheck is not only quicker, it’s also easier and much more convenient. Those going through the Precheck lane aren’t required to remove shoes, laptops, liquids, belts or light jackets. These benefits can be especially helpful for those with limited mobility who may be traveling with a wheelchair or motorized scooter. Travelers are still required to undergo alarm resolution safety procedures and the screening of mobile devices with a handheld scanner. To see which airports offer these services, a simple search on the TSA Precheck webpage can be done. The Precheck system can offer many benefits to frequent travelers and allow for decreased time spent in airport security. It’s important to fill out the application form with enough time before anticipated travel to receive your KTN. Even with this reduced time in security travelers should still allow plenty of time to get through the airport before their flight time. With all the new enrollment centers for Precheck, many more people will have access to the program and can go through the application process easily. This program should help reduce some of the stress that comes along with going through airport security procedures and make the overall travel process easier.